My early autumn bonfire continues, and my Jelly Bean Border clean-up has started in earnest. 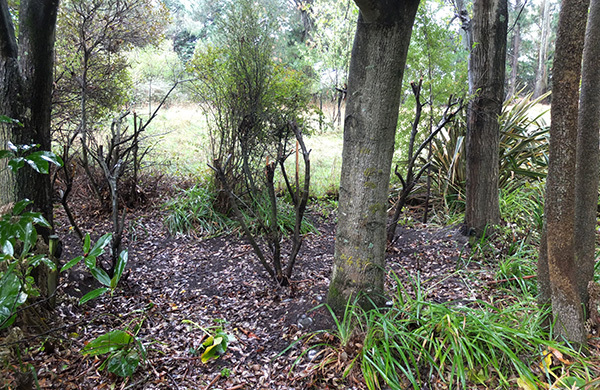 This was the first garden I dug in the Pond Paddock, and is providing much burnable mess (Viburnum branches, dead leaves, prunings from overgrown shrubs). And a little inspiration, too - a gentle reminder that garden over-growth can result in positive, healthy change. Already I like the shapes (now visible) of the larger tree trunks, and the cheerful streaks of low light. Those Viburnums were too tall, too scruffy, and had major leaf issues (see the footnote below). I need a garden that's healthy, with minimal spraying from me. I have far too much else to do! This coming weekend Non-Gardening Partner has promised he will arrive in the Pond Paddock with the chainsaw and help me. Promised? Well, he gave a vague nod as I outlined all my plans for him. But had he listened properly and processed it all? 'Not really' he confessed, being an honest chap. But he will help, I know. 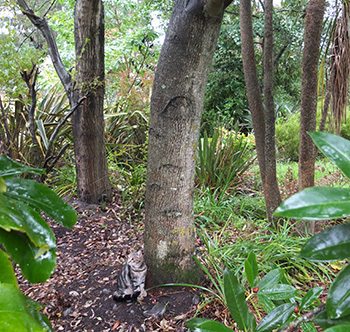 I will have to point at things (a branch of the Oak tree which crosses through the flowering cherry, a dead tree by the side of the pond, and the stumps of those Viburnums, to give a few examples). They are extremely obvious, if one looks up, around, and about. I am also wondering about enlarging the gardens and decreasing the so-called 'paddock', which now has a lot more shade. Some of the lawn is very mossy, and there's much leaf fall. 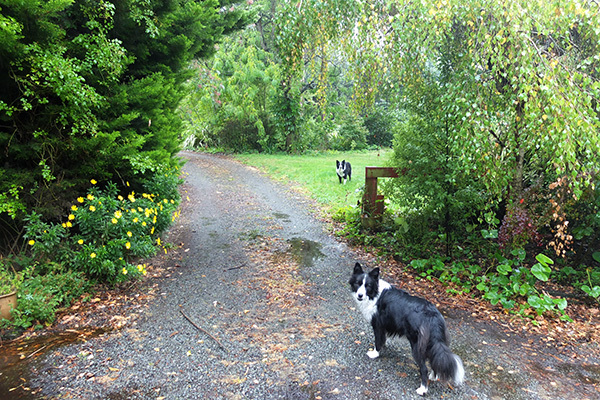 The boundary Eucalyptus trees have been dropping leaves for weeks, and hey! Autumn leaves are starting to colour up and flutter down, the golden yellow ones first. Oh well. That's just about enough blithering. Time to get this show on the road. Except it's drizzling... Might just go through my latest photographs, show you what's blooming. Autumn rain is in the air, and the colours in the garden are wonderful.